The experience of viewing a Bonnard painting is related to way I view a garden. On the first walk around the current show at the Metropolitan Museum, I identify the “objects” in the paintings – a vase, a bowl of fruit, a chair. On the second walk around, the objects disappear and all I see are colors and textures. Wallpaper is pattern, flowers are colors, and figures are shapes. On the last walk around, my brain goes back to the narrative and the structure. In a garden, I immediately identify the plants. On the second pass, I am consumed by texture and color and light. The garden is like a Bonnard interior. The structure fades away and sensual pleasure takes over. Perhaps, the most interesting part of the Met exhibition is a little room off the main gallery, filled with small calendars (3x6) Bonnard kept. These datebooks are covered with scribbles…ideas for paintings or just ideas. Another artist, far from Southern France and the art world, also drew only the everyday objects and scenes in his native Idaho. James Castle, an artist born (1899-1977) deaf, who didn’t read or write, currently has two shows in New York. Without a big review in The New York Times, I would never have paid attention to his work. He used found paper, soot from a wood burning stove and spit to make small drawings of his everyday surroundings that are sublime. Bonnard never painted directly from “life,” he used the drawings he made as reference points to create his paintings. Castles’ work is his drawings, watercolors and constructions. With everything I love about the Blackberry, Iphone, and Ipod, these scribbles and drawings remind me how much is conveyed by the hand of an artist. Can anything digital replace it? “In Flower, the surrounding environment, most often pushed to the background in games, is pulled to the forefront and becomes the primary "character." The player will journey through a beautifully vivid and changing landscape in this fresh and genuine game only on PS3. 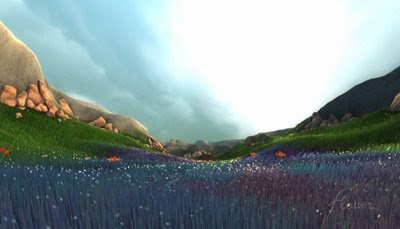 The player acts as the wind, picking up a petal, and taking it around a lush environment. You can cause the wind turbines to spin. And with each delicate touch of a wind-carried petal, other flowers bloom. To progress in the game, players must explore the environment, touching flowers as they go and encouraging them to bloom. Together, they create a more colorful, bright environment on-screen. In this shot, color is spreading across a field of grass. If you get tried of weeding or composting, try playing Flower. See how the virtual world compares with the “real” world of gardening. Call it what you will, recession or depression, these days it’s hard not to walk around with a drooping head. Cleaning up in the garden this week, I was reminded that a drooping head can mean something else. The hellebores were nestled among crunchy fall leaves. Once cleared away, I received the appropriate clichéd jolt: spring is on the way. Some people can go to a room full of 16 th century paintings and spin a great yarn, because they can read the religious iconography. I like the tales that plants tell when you look into the origin of their names. Hellebores are stubborn members of the Ranunculaceae family. Their history is in dispute. Some historians believe Alexander the Great overdosed by eating hellebores. Others believe a Greek general used the flower as an early example of biochemical warfare. John Keats used hellebores as a metaphor to describe “each ample curl” on a certain woman’s head. I only know one thing for sure about hellebores. It’s hard to keep a drooping head after you’ve passed by a hellebore. This was a proposal I wrote for a garden show a few years ago. I was unable to produce the design, because it proved too expensive. Ironically, these days garden shows are being cancelled, for fear of poor attendence. After two years of disappointments, I dragged myself to the Philadelphia Flower Show with trepidation. This year’s theme, Bella Italia promised “everything wonderful about Italy - gardens, culinary arts, entertainment and shopping.” Who could ask for more? Fake columns, bad sculpture and terra cotta colored paint don’t make for Bella Italia. The show was larger then ever, filled with extravagant exhibitions. But it missed the mark. Italians love the shabby, the worn: patina is revered. Americans crave a sense of perfection. The exhibitions failed on the Italian theme, but pleased on another. I marveled at how the exhibitors coaxed, and cajoled, spring-bloomers, summer-pleasers and fall’s last stand to bloom in March. The show gardens were closer to a display of tarts and gateau in a fancy patisserie, then gardens from which we can learn something. To me it was a Rocco nightmare of texture and fragrance. Sometimes when I am stuck inside these convention centers, I feel the need to throw cold water on my face and do a reality check. Luckily, there were some interesting trends rooted in the earth. 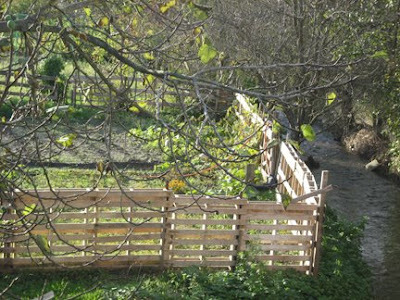 Green roofs, vertical walls, native plants and lots of vegetables. The vegetables were mixed among perennials and bulbs. 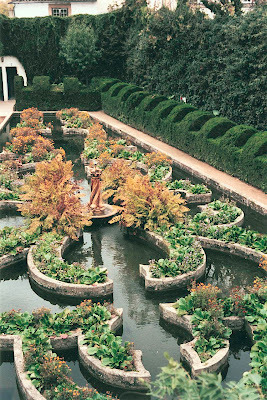 It reminded me that vegetables are interesting ornamental plants: lettuces bumped up against sedums, rainbow chards sprang up among heucheras, herbs were hidden among ferns and spinach was treated like a ground cover for rhodies. At booths with stuff for sale, the seed counters were overwhelmed with customers. The price of a bunch of roses had been reduced, but organic and heirloom seeds were flying off the shelves. 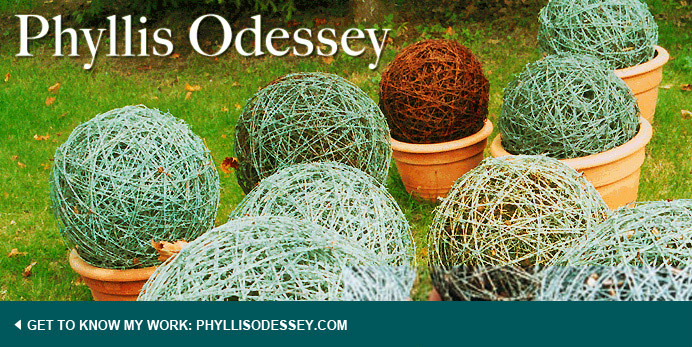 The floral displays drew oo's and ah's, but the real impact lay elsewhere. I was jostled and pushed and I still came away optimistic. Americans have finally gotten the message: It’s not only cheaper to grow your own food, it’s just plain fun. Mothers consulted small children on what brand of tomatoes to grow this year. Practiced gardeners investigated new varieties and sought out heirlooms never before seen. I went for the chocolate colored peppers and Thai basil. WC Fields epitaph was "I'd rather be here, then in Philadelphia." On this day in March, good food and taste are returning to Philadelphia. So begins Patrick Lane’s memoir. I would like to recommend this book to gardeners and everyone who feels some relation to the natural world. Every chapter ends with a list of plants, animals, birds and insects. Who else but a true gardener would bother? “Thomas Jefferson in his Garden Book said, “But though an old man, I am but a young gardener.” That is true for me as I labor in the daily meditations of earth, air, stone, and water. There are only young gardeners. “ Patrick Lane’s knowledge of gardening literature is vast. You find yourself making a list of books to read or at the very least references to check. 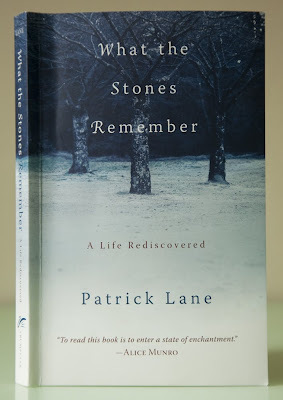 What the Stones Remember is also a book about addiction, families, parents, but most of all it’s a book about writing. I urge you to PAY ATTENTION to Patrick Lane. 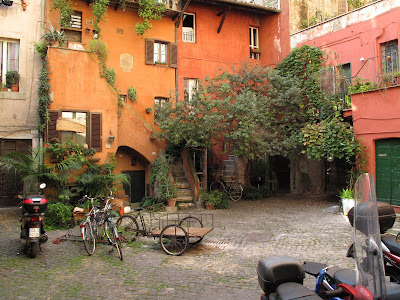 To see green in Rome, one needs to be a Nosey Parker. On a recent visit to Rome, I was surprised to find few public gardens. The streets are so narrow; that putting potted plants in front of shops or residences quickly turns them into an endangered species. Rome is a city of layers, and if you want to experience it’s gardens, you need to poke your head in doorways, alleyways and push open gates. 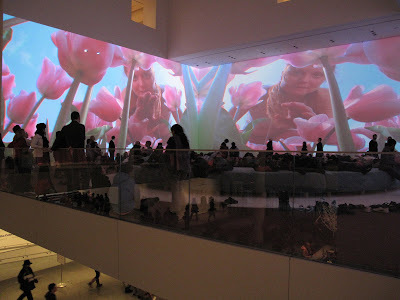 I’ve been going to MOMA since I was in junior high school and I can’t remember any “show” that turned the museum into a playpen until Pipilotti Rist’s Pour Your Body Out. The Swiss video artist used 7354 cubic meters of space on three walls in the atrium of the museum to convey her non-narrative trip through a hyper version of the natural world. Pipilotti also designed a donut shaped pink sofa for viewing the video. The womb-like interior space became the domain of kids and parents. The top of the sofa was taken over by those eager to take a nap. If you were unnerved by the chaos inside the donut, you remained outside, leaning against the sofa and watched the video from a “safe location". What does any of this have to do gardening or horticulture? Lots. The video is a group of images linked together by saturated color - primarily pink. The camera is at eye level with the plants: you breaststroke your way through a field of 16-foot tulips. I felt the power, the color, the strength, the erectness, the smoothness, and the shininess of these tulips. This virtual garden heightened my senses and told me something about this species one could never experience in reality. I found myself wanting to go to MOMA just to experience this little bit of joy in an overwhelming depressing world. Leaving the installation, I descended the stairs, went out the revolving door and hit the snow-clad streets of Manhattan. I felt warm. Pipilotti Rist had put her arms around me.